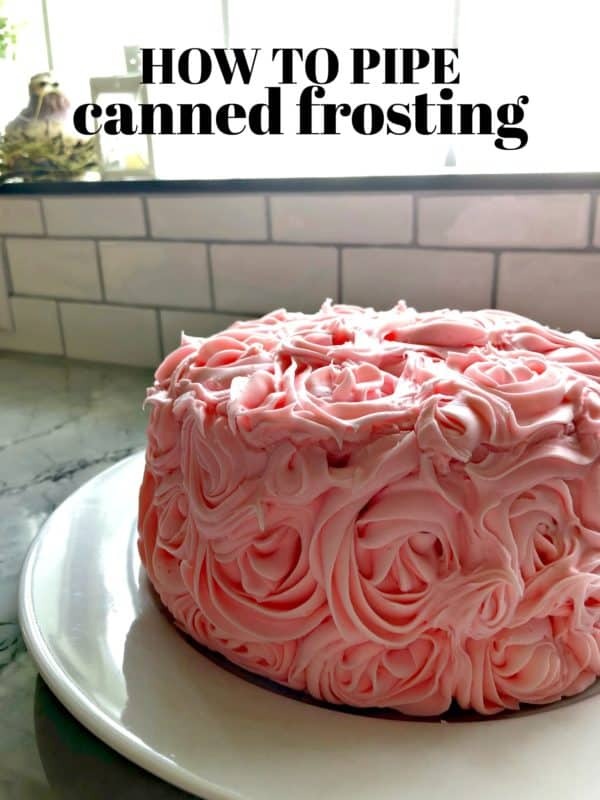 Learn how to pipe canned frosting with my easy hack. Your friends and family will never know the difference and your cake will still look gorgeous! Well, I took an unintentional few week’s off from blogging. Life has been extra crazy and I would like to partly blame life for that. But that’s the beauty of owning your own business and being your own boss. During my few weeks off I was party planning and prepping for my daughters 1st Birthday party. I haven’t been too open about it, but I’m sure you’ve noticed if your a long time reader that I’ve started sharing quite a few dairy free recipes. That would be because last year I found out my newborn daughter had a dairy allergy. Thus–forcing me to go dairy free since I was breastfeeding. So what does that have to do with piping canned frosting? *MOST* canned frosting’s contain NO DAIRY! So while I was party planning and trying to figure out what the heck I was gonna do about her first birthday cake. That’s when I put two and two together that I could probably stiffen up some canned frosting from the grocery store so that I could still pipe it and make the birthday cake of my her dreams. I always envisioned her first birthday cake being stocked full of rosettes so that’s what I wanted to do. Needless to say, it worked! Now–hold on right now. I know I’m about to get inundated with HATE mail because I fed my one year old canned frosting. I recognize their is so much “stuff” in canned frosting. Not all good for you. However; sometimes you have to live a little and try and forget about what is in it. Yes–this comes from me a relatively health conscious individual. Yes, I realize I could have made vegan buttercream. However, I did not have time to test nor did I have the energy. Some times you just need an easy short cut and that’s why I’m sharing my “hack” for how to pipe on canned frosting. You just need two ingredients, a piping bag and piping tip and you are in business! 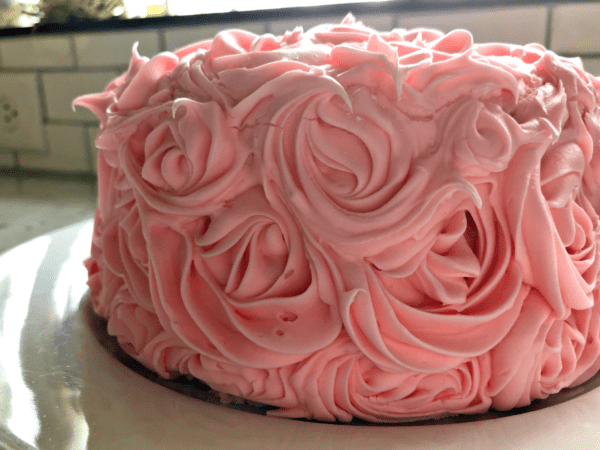 The best part is that none of my guest knew that it was canned frosting on the beautiful decorated rosette cake! It will be our little secret. I will admit that the already sweet canned frosting becomes even sweeter with my method of adding more sugar to the frosting. I’m not sure if their is a way to get around this. Nor have I tested any other methods. 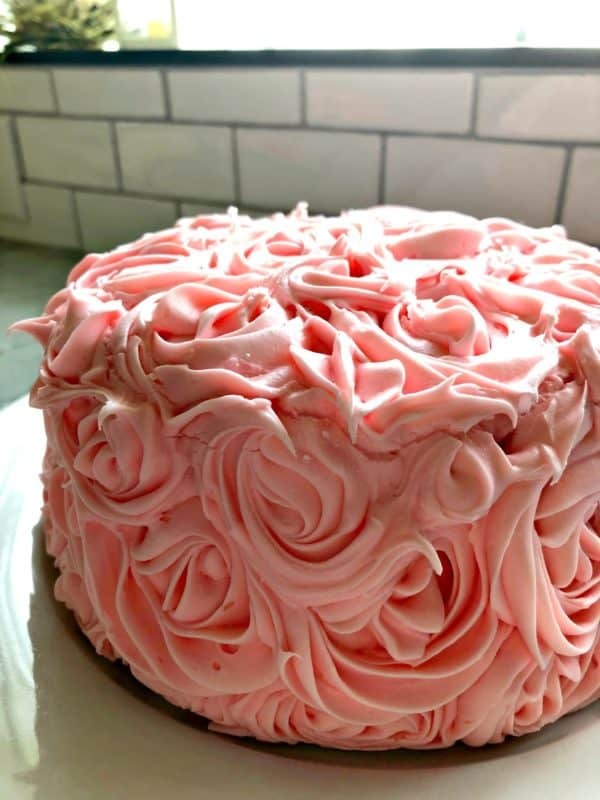 I hope that if your wanting to achieve a beautifully decorated cake but don’t have the time that my method for piping canned frosting comes in handy! Empty both cans of frosting in a stand mixer fitted with a paddle attachment. Pour in 1/2 cup of powdered sugar. Mix on low speed until powdered sugar is incorporated then whip on medium speed for 30 seconds. Turn the mixer off, lift the paddle attachment and see if the frosting is stiff and thick. If it still seems a little on the soft side add in the additional 1/4 cup of powdered sugar. Repeat step one with mixing until stiff. Using a piping bag place the 2D piping tip in the bag (for rosettes). Fill your piping bag 3/4 of the way and begin piping on rosettes. Once frosting is almost done, repeat by filling bag and piping on more. Do this until your cake is full of rosettes. *If you don't have a stand mixer you can use a hand mixer. **Make sure you do a light frosting of your cake prior to piping on your design (such as rosettes). I like to use this easy pourable frosting method. For a 6-inch cake this takes almost 1 can of frosting for me (with two layers so frosting the middle layer too)! Hi Carrie, I’m so sorry to hear about how severe your daughters allergy is. I’m glad I could share this little hack with you. I’ll have to try the homemade dairy-free version one day! This does work. The cake looked great. Birthday cakes aren’t meant to be health foods. A few treats on occasion is fine and why the word “special” is often placed in front of “occasion”..
Hi Jayne–glad it worked for you! I agree– treats are treats and not always meant to be healthy. For my daughter, she had a dairy allergy but I still wanted a pretty cake for her first birthday. This alternative route worked best for me! I don’t have a paddle attachment for my mixer, will it still be ok? Hi, do you own a hand-mixer. I would use that. I would be afraid it might break a wire whisk attachment. My 15 year old has a dairy allergy and a little girl in my class has one as well. I usually just spread the icing on my son’s cakes but I want to make cupcakes for my class and pipe icing so that all the kids in my class can enjoy the same treat and this is perfect. Thank you for this!